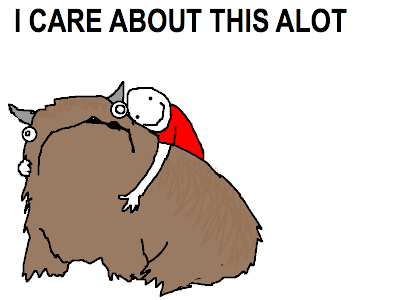 Occasionally I will type 'alot' instead of 'a lot'. When I notice this, I smile and think of this article from the 'Hyperbole and a Half' blog*. In it she offers advice for dealing with the anguish caused by the poor grammar of internet commenters. Her best one centres on the mythical creature the Alot. 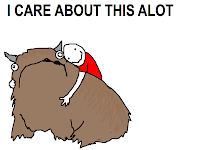 Everytime she sees the word 'alot' used she imagines they are talking about a real creature - as seen on the right. * My spell checker is underlining 'blog' and offering me 'biog', which is apparently informal for biography instead. That is a new one for me. Who uses 'biog'? What's wrong with 'bio'? One that I find difficult to explain why it is funny is is the Spaghatta Nadle. I do not know why I find it funny. It is silly, it is stupid, but it made me laugh out load.